Particle & Surface Sciences have released the new Micrometrics ASAP Xtended pressure sorption analyser. The ASAP 2050 retains many of the design elements of the ASAP 2020 in addition to being able to collect physisorption data in an elevated-pressure environment. 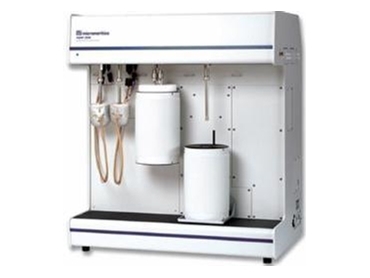 The ASAP 2050 Xtended pressure sorption analyser is an easy-to-use instrument capable of collecting physisorption data in an elevated-pressure environment. While retaining many design elements of Micrometrics’ popular ASAP 2020, the ASAP 2050 analysis manifold is equipped with a pressure transducer capable of operating from vacuum to 10 atmospheres. The instrument is suitable for fuel cell, hydrogen storage, and pressure swing adsorption research applications. Two independent vacuum systems allow simultaneous preparation of two samples and analysis of another. Sample preparation and analysis can occur concurrently without interruption and without the risk of cross-contamination. A chiller Dewar and recirculating bath allow the ASAP 2050 to be operated indefinitely. The instrument also supports the use of a standard Dewar with cryogen (typically liquid nitrogen or argon) that will provide at least 50 hours of unattended analysis without refilling the Dewar. Custom straight-walled, stainless-steel sample tubes are capable of safely withstanding temperatures and pressures well beyond the system’s specifications. The evacuation criteria and temperature profile for each ASAP 2050 sample preparation port can be programmed to incorporate specific vacuum targets and custom ramp rates with temperature plateaus. The temperature and rate of temperature change can be set and monitored individually and controlled from a few degrees above ambient to 450°C. A programmable pressure threshold suspends the temperature ramp if the outgassing pressure exceeds the threshold. Special degas heating mantles can be used to prepare samples in situ on the analysis port prior to analysis. In addition to controlling the instrument’s operation, powerful Windows software also reduces the raw data collected during the analysis. An interactive reporting system includes a versatile graphic user interface for custom presentation of results. The standard ASAP 2050 system offers a wide variety of reports, including DFT (Density Functional Theory) and isotherm cycling. Particle and Surface Sciences are the sole distributors for the Micrometrics range of products throughout Australia and New Zealand.